Sometimes I skip the introduction section of a book; forego the preview and delve into the beginning. I’m glad I didn’t do that with our book club selection, Adventure in Everything by Matthew Walker. There is so much good stuff packed into the Introduction that it’s impossible for me to discuss everything in a less than 1,000 word blog post. So, your homework is to review elements discussed such as, the beginner’s mind, journaling, and adventure stories. I’d like to focus on a breathing exercise described: push your problems away, close your eyes, and focus on your breath for 15 seconds. The first step is to just breathe. Easy, right? We were able to do it the second we were born without instruction. In fact, the first time I recall formally thinking about breathing was when I exercised along with Jane Fonda and her fitness fanatics through video in the late 1970’s. Jane would shout out, “Don’t forget to breathe,” as she guided viewers into shape. I remember saying, Duh, Jane! Thanks for keeping me alive. Like I needed her to remind me to inhale and exhale. Now that I’m older and wiser, I realize she meant you’re probably holding your breath as you try to lift your leg as high as mine. If you keep breathing your movements will be more fluid. 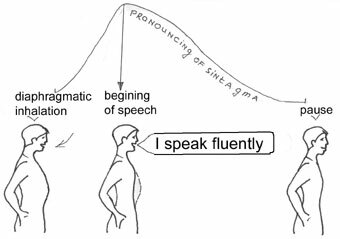 The second time the breath made a formal appearance was when I was in graduate school studying to become a speech-language pathologist. I learned that respiration was not only our primary life force, but provided the energy for speech. A full abdominal breath was the starting point for many successful stuttering treatment programs and breathing exercises were an essential therapy component for neurological disorders such as Parkinson’s disease. I began to have more respect for breathing not only because I was learning about the complex anatomy and physiology involved, but realized that it had healing power. The third time was when I was twenty-nine-years-old and pregnant for the first time. I enrolled in Lamaze class where techniques utilizing several breathing patterns in order to encourage relaxation were taught. Let’s just say I should have paid better attention. Now that I am practicing yoga I truly understand how the breath can enhance the human experience. Life energy (prana) enters the body through the breath and is sent to every cell through the circulatory system. Although there are many types of yogic breathing, the traditional full yoga breath when employed on a regular basis has the power to dramatically reduce emotional and nervous anxiety, calm the mind, and integrate the mental/physical balance, release muscular tension, just to name a few benefits. We’ve established in past posts that fear accompanies new adventures. Fear causes us to tense up and we will most likely hold our breath in those moments, stopping the energy flow. For example, the adventure I will focus on is taking my second novel to publication. I’ve hired a top-notch editor and my manuscript is due to her by December 15. My fears include: I won’t have it ready on time; I’m wasting my money; novel two isn’t very good; the publishing industry is too competitive; and on and on. What do you think happens to my writing as these thoughts pass through my mind? 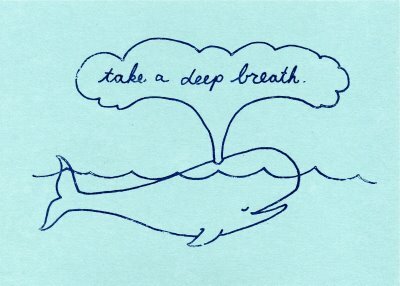 During these insecurity attacks I need to practice the 15-second breathing technique: Clear my mind and focus on my breath, then keep it flowing. Magic! Confidence is re-instated and the words soon follow. If you read the Introduction of Adventure in You, please share something that you feel will help you. Categories: Uncategorized | Tags: Adventure, Book Club, writing | Permalink.